Valentine’s day is coming up and with it comes all kinds of quote/unquote “romantic” propaganda. I can’t turn on the TV without seeing ads for things like flowers, flower shaped fruits, heart shaped chocolates, and Christian shaped soulmates. Call me a pessimist, but I don’t see how any of that stuff equates romance. Maybe it’s because I’m dead inside. Or maybe it’s just that defying expectations brings me joy. It’s right up there with warm blankets from the dryer and watching babies deal with a piece of tape for the first time. I’ve never been a big fan of the beach. It’s smelly, it’s hard to park, the ocean air leaves a film on your skin, and you’ll be haunted by sand granules for days. It’s just a big hassle. Sure you can have a lovely view of the sunset...but so what? It’s not like you can look directly into it. Actual cheesy picture my boyfriend and I took at the beach. Because we're cool. I might be in the minority here, but I don’t see the big appeal of jewelry. It’s just so expensive for so little return. When I find out how much jewelry costs, all I can think about is how many cookies I can buy for that much money. The exception, of course, is Swarovski crystals. 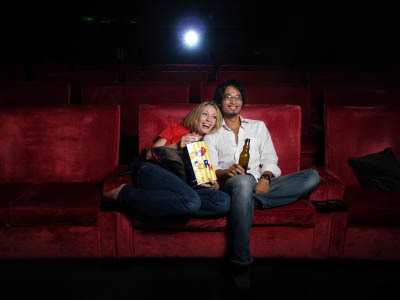 Movies seem to be a typical “date night” trope. But do they still keep that appeal after high school? I get that when you’re young and cheap it’s a good excuse to be alone in the dark with someone, but there are plenty of other ways to do this when you’re older. If the thought is that seeing people make out on screen will inspire you to make out in real life, then by that logic you can get the same result by watching the CW for five minutes. Go ahead and Google "romantic updos". This is the kind of stuff that comes up? Why does this hairstyle scream “romantic girl”? Who wants hair dangling in front of their eyes? It’s really annoying in real life. I imagine. I don’t have the patience to arrange my hair this way.